Western blot analysis of extracts from Jurkat cells, using BAZ2A antibody.The lane on the right is treated with the synthesized peptide. 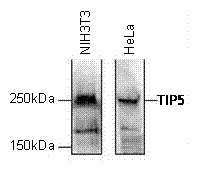 WB was performed on 150 ug nuclear extract from either NIH3T3 or HeLa cells with the antibody against TIP5, diluted 1:1,000 in PBS containing 5% milk powder and 0.1% Tween-20. The molecular weight marker is shown on the left, the location of the protein of interest is indicated on the right. 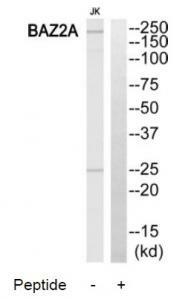 Chromatin from HEK293T and NIH3T3 cells was formaldehyde cross-linked and sheared toan average length of 200-400 bp. ChIP was performed overnight at 4C with 100 ug sheared chromatin and 5ul of anti-TIP5 or IgG as negative control. The IP’d DNA was analysed with qPCR primers for the promoter and the coding region of the 28s ribosomal RNA gene. 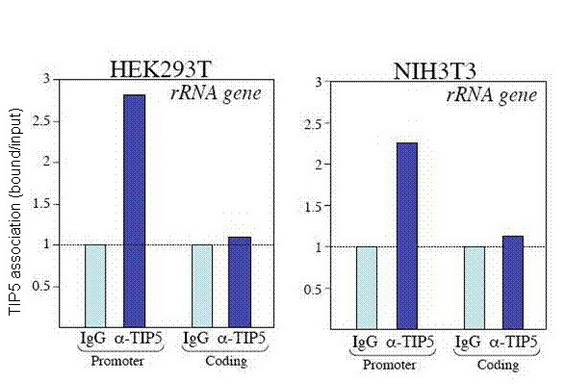 Image shows the recovery by the TIP5 antibody and by IgG: both in HEK293T and in NIH3T3 cells, TIP5 is associated with the promoter, but not with the coding region of the 28srRNA gene.